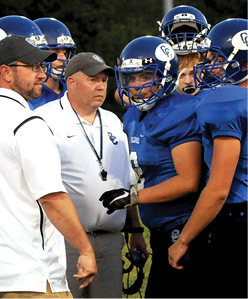 After being Clinton County’s head football coach for 10 years, and finishing with the best record in school history at 9-1, Jamie Miller has decided to hang up his whistle at Clinton County and resign from the head coaching position. There had been some back and forth with his position as head coach following this year’s record season. Miller said after his season evaluation, he was given the choice to resign or recommended not to be rehired. Miller said he had met with his team a couple of times and told them that he wouldn’t be their coach and then told them he would be. Miller said he wants to be with his family more and he wants to secure the program. Miller said he has had numerous job offers since he’s been at Clinton County, but for now, he wants to just teach and support the program. Going from working on the next season to nothing is going to be a bit of a challenge for Miller this year. Clinton County went from not winning a game during Miller’s first three years to only losing one game last season. “I can see the progress the program has made over the years,” Miller said. During Miller’s fourth year, the Bulldogs improved its record to 4-6. In 2014, the Dawgs posted a record of 3-7 and in 2015 the program went .500 with a 5-5 record. In 2016, the Dawgs did the same with a even 5-5 finish, but in 2017, the Dawgs finished with its first winning season of 6-3 on the year. In 2018, the Dawgs put together a stellar year and went 9-1 with hopes of entering district play again in the fall of 2019. Nasief said Miller’s resignation came on Friday, January 4, and the job has been posted since January 7. She also noted the position has to be posted for a minimum of 15 days, before the principal, Stacey Evans, will receive applications to be presented to the Site Based Decision Making Council.